I have always wanted to be bilingual. For a short time, I was conversational in Spanish, but it's been years since I've spoken it, and I feel like I'm back at an advanced beginner level. My husband's affinity for French rubbed off on me, but I haven't made it past numbers, colors, and basic greetings. My first language love was American Sign Language (ASL). In elementary school, we had a session called D.E.A.R., Drop Everything And Read. It was 30 minutes of reading anything -- the student newspaper, a library book, or a book from the reading corner. 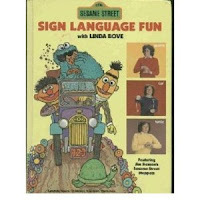 My friend, Trina, and I used to check out ASL books and sign to each other. Our teacher loved what we were doing but didn't want us to distract the others, so she let us sign to each other in the teacher room or while sitting on the floor next to her desk. We would pass the book back and forth, interpreting each other's sentences. We used a lot of finger spelling, which isn't true ASL, but we were proud of ourselves. When I got to high school, I was disappointed that ASL wasn't offered for the language credit. I had hoped I was finally going to get real educational instruction. I still haven't taken a formal class, but if I had the time and money to take a community college class for fun, I would take ASL! That video led me to this one by CaptainValor on YouTube. I'm not a Miley Cyrus fan, and I know this song is cheesy, but just look at him. He's so stinkin' adorable. Even though I won't be an old signing pro by the time I'm a mother, I still plan on using baby sign language. I believe it works and that it gives babies a stronger opportunity to communicate before having verbal skills. My favorite little signing baby? Fireese. Her mom started My Smart Hands after the success her family had. Fireese is a big kid now, but look at these videos from the My Smart Hands YouTube channel! Do you know anyone who is deaf or hard of hearing?Do you know how to sign?All my mama friends, did you try baby sign language with your little ones? Drop Everything And Read! Totally forgot about that! My school did that too and I loved it. 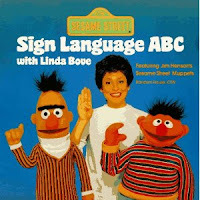 We also learned how to spell in sign language and would sign with our teacher in 4th grade. I've always been fascinated by ASL, but all I know is that alphabet. I've thought about the baby signing...I'll definitely look into that someday. Have you watched "Switched at Birth" on ABC Family? I've only seen a few episodes because those shows are a little overdramatic for my taste, but I'm completely fascinated by the girl who plays one of the leads, who is deaf. She's a very compelling actress, which is commendable in and of itself, but when you add in the fact that she has to sign everything she says while speaking with the deaf accent, hitting her mark, and oh yeah, acting, it's really impressive. We had D.E.A.R. too!! I wasn't as creative as you though..i just picked up whatever was around! I have heard good and bad things about baby sign language..mostly that it is useful just at home..but there are so many variations out there so not really much in the way of consistency! I have SOOOOOO much to say about this post - love it! We love ASL at our house bc my brother-in-law is deaf, so I started taking classes when I got married! We sign with our 10-month old daughter, but she hasn't really caught on yet. I keep trying. SPEAKING of my 10-month old daughter, I just had a total mother-of-the-year reading this post while she sits in her high chair eating dinner. I click on the KeSHa song and when it comes on little E starting CRACKING UP! she LOVED it. Lol. Remember that Friends episode when Rachel and Ross sing "Big Booty" to there baby? I was totally channeling that. Anyhoo, ASL rocks. I learn more each time I hang out with little bro Josh and his Mom (she is fluent too of course.) I could go on for days about ASL but little E needs some lovin. Love ya Linds! I took 3 years of ASL in high school! Loved it!!! I still remember a LOT of it because I feel it is so expressive, which is my style :) there is a huge ASL program where I teach (same HS I went to) and they even do a choir night where they sign popular songs and it's choreographed to lights and music!! I want to teach K a few signs and I'll probably start soon, but I don't know what to do since she is with a babysitter during the day. Maybe summer? I totally had the Semesme street sign book! It was one of my favorites too. One of my closet cousin is deaf so I learned at a very young age to sign and have always loved it!!! I will DEF be teaching my future babies to sign!!! My school totally did D.E.A.R. I was also part of a Sign Language Club for two years in elementary school. Sadly, I've forgotten 99% of it. I love ASL and the deaf culture as well! It has always fascinated me and I've taught myself sign language over the years. Even have done some of that theatrical stuff with my church, interpreting songs but dramatic. I love it. I hope to use it as a ministry one day. There's an interpreter at our church now and I always end up watching them the most during the services, ha! I plan on getting officially certified at some point and have found classes that do that in the DFW area. My sister did take ASL as one of her languages in high school and kept up with it- then taught her two kids sign language from the start. They communicated earlier, more proficiently, and, when they started verbalizing, their word structure seemed better than most kids their age. My other sister did it, too, and her youngest was signing full communications (wants, dislikes, etc) before she was a year- and then verbalized later than most! Funny thing, I got used to doing it with my nephew (born '01) and when my husband and I got our oldest dog I used signs along with verbal for her commands- some are real, some I made up, but it sure comes in handy! Signing for babies is GREAT! Fireese was such a cute baby! I love her enthusiasm in learning. After dappling with ASL in high school, I would definitely like to start learning more and incorporate that with my future kids. french translation service Good information here. I will post these information to my facebook page. It is really very informative for others.